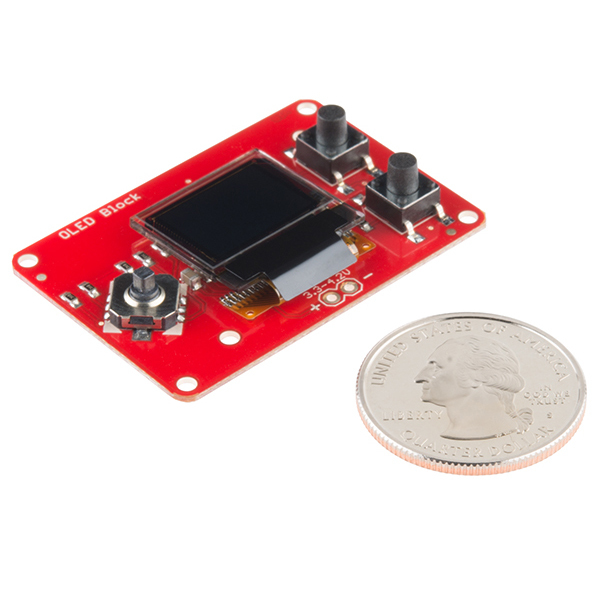 The IntelÂ® Edison is an ultra small computing platform that will change the way you look at embedded electronics. Each Edison is packed with a huge amount of tech goodies into a tiny package while still providing the same robust strength of your go-to single board computer. Powered by the IntelÂ® Atomâ„¢ SoC dual-core CPU and including an integrated WiFi, Bluetooth LE, and a 70-pin connector to attach a veritable slew of shield-like “Blocks” which can be stacked on top of each other. It’s no wonder how this little guy is lowering the barrier of entry on the world of electronics! Equip your Edison with a graphic display using the Edison OLED Block! Simply snap this board onto your Edison to gain access to a 0.66", 64x48 pixel monochrome OLED. To add some control over your Edison and the OLED, this board also includes a small joystick and a pair of push-buttons which can be used them to create a game, file navigator, or more! If you are looking to add a little more stability to your IntelÂ® Edison stack, check out this Hardware Pack. It will provide you with increased mechanical strength for stacking Blocks on your Edison!